Using this gadget, you can add icons that link to your profile on a number of popular social networks. The style of the icons depends on the current website theme unless you choose the Default icons gadget style (which displays the standard icon for each social network). You can insert the gadget into a page onto your site, or into a page template so that all pages that use that template will automatically display the gadget. For instructions on inserting, moving, and deleting gadgets, see Gadgets. You can also use theme overrides to add options to link to other social networks. Using the gadget's settings, you can control its appearance and content. For instructions on displaying gadget settings, see Gadgets. Enter your social profile name or a link to your profile for each social network you want to display icons for. If you don't want to display icons for a particular social network, leave its field blank. (Clean Lines, Dark Impact, Treehouse, and White Space themes) Controls whether the icons are left aligned, right aligned, or centered within the gadget. (Terra and Firma themes) Allows your social icons to appear on the outer right edge of the placeholder and remain in position as the viewer scrolls the page. Choose whether to display the icons horizontally or vertically. For Kaleidoscope themes, use a Headline gadget instead of specifying a gadget title. The gadget style determines the physical appearance of the gadget. The style you choose will determine the color and format of the gadget title, the gadget content, and the gadget border. 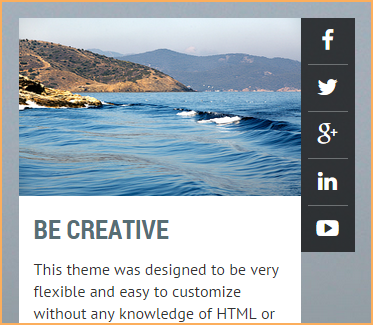 You can choose from theme-specific styles and styles that are common to all themes. The Default icons style displays the standard icons for each social network (instead of Wild Apricot's stylized icons). (Kaleidoscope themes only) The amount of space – in pixels – that appears between the content of the gadget and the outer limits of the gadget. You can set top, bottom, left, and right padding separately. If you have set a fixed height for the gadget, the bottom padding will be ignored. Under the Website menu, click the Theme overrides option. From the Theme overrides screen, click the Activate theme overrides button. You can download the theme files (stored in a zip file) to any location you choose. Within your downloaded file structure, locate the \Gadgets\SocialProfile\Images folder. If the folder doesn't already exist, create it. In the Images folder, add a graphic to represent the social network you want to link to. Most social network provide icons in a variety of sizes and styles on their sites. Soundcloud icons, for example, can be found here. For best results, use a PNG file with a transparent background. Within the \Gadgets\SocialProfile folder, open the Settings.cfg file using any text editor. Within the \Gadgets\SocialProfile folder, open the SettingsLayout.cfg file for editing. Within the \Gadgets\SocialProfile folder, open the GadgetTemplate.tpl file for editing. where Soundcloud is replaced by whatever social network you are linking to, soundcloud.png is replaced by the name of your graphic file, and the height and width values are set to those of your graphic. Save the changes you made to these theme files. From the File management screen in Wild Apricot, or using WebDAV, upload the modified files to the corresponding theme folder on your site. 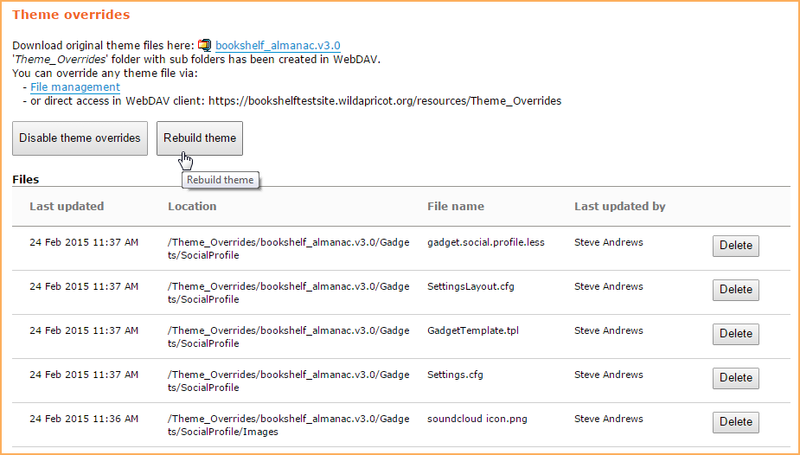 Go to the Theme overrides screen and click the Rebuild theme button. Now, the new social network option should appear within the social profile gadget settings. You may need to log off and back on again to view the new option. Once you enter a URL for the new social network, the icon you added will be used as the link to your network profile.